A San Diego eatery is going to be featured on a food-related TV program and, for once, it's not Diners, Drive-Ins and Dives. That non triple-D eatery is North Park's Sea Rocket Bistro, which has gained a good deal of attention of late after bidding its former chef adieu earlier this year to bring on new exec chef and partner Chad White. But it's not a back-of-house shake-up that got the attention of the Cooking Channel. Fresh local sardines will be the subject of an episode of the program Hook, Line and Dinner that will air this Tuesday, July 26 at 7:30 pm. 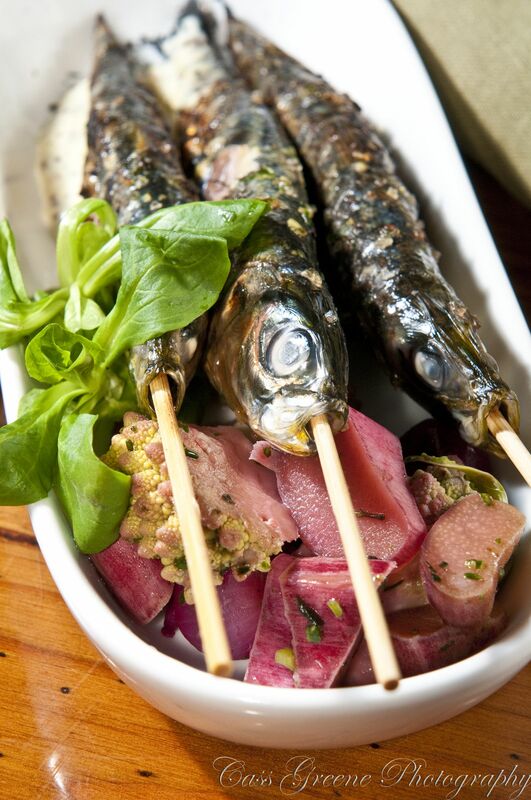 Sea Rocket offers three sardine preparations - grilled whole as part of a salad with asparagus, watercress, a pickled ranch egg and Sauce Vierge; served with with mustard aioli and pickled veg; and stuffed into street tacos during happy hour. Diners who prefer to taste the old fashioned way versus just feasting with their eyes can get a five-course survey of White's culinary style at a beer dinner featuring brews from Santee's Manzanita Brewing Company. The menu includes Baja grouper balls (no, it's not the seafood equivalent of Rocky Mountain oysters) served with Sauce Gribiche (a classic French sauce made with mustard, pickles, capers, and herbs) and a taster of River Walk Blonde; Santa Maria-style barbecued beef tongue with padron peppers and Manzanita's new double IPA; and a beer sundae topped with molasses, toffee, and White's trademark salty-smokey-sweet bacon jam. The latter comes with Gillespie Brown Ale...because it wasn't nearly decadent enough on its own. White's even using Manzanita wood to smoke chicken for use in a filling for a ravioli dressed with dark, rich Oaxacan molé sauce and topped with a smoked apple and walnut salsa. The Manzanita event will take place on August 11. Dishes can be ordered as a full tasting menu or a la carte. Sea Rocket Bistro is located at 3382 30th Street.